Colourful Revolution stands for the Spring 2016’s protests in the Republic of Macedonia that recently went viral in all international social media and networks. Macedonia made it for the first time on the map of Spring protests and occupy movements in Europe and worldwide as the protests that resulted into the biggest and ongoing visual colourful interventions in the public space in Macedonia. Colour and the colourful interventions (although resonating with the Rose Revolution in Georgia) was what distinguished this unique outburst of public discontent of the protestors who executed their interventions with paintball guns throwing paints thus creating a stochastic temporary colorful layer over the city public buildings and monuments, mainly concentrated in the centre of the country’s capital Skopje. Thus the Colorful Revolution and the ‘colourful commandos’ simultaneously opened many discursive debates around the issues of activist and protest art, the political results of such creative actions and whether these actions are vandalism or art, both in political activist circles and in the local art scene. The protests started in the aftermath of a wiretapping scandal which revealed that the government has wiretapped more than 20,000 people, and on the day after the Macedonian President George Ivanov announced his decision to pardon app. 60 politicians currently charged with crimes or under investigation. The President Ivanov has been accused of teaming up with the ruling VMRO-DPMNE party to protect party officials from any trial and prosecution. However, the protestors combined the political demands for withdrawing of the President’s decision (that was withdrawn in meanwhile) and for postponing of the elections which originally were planned for 5 June (also postponed) with a severe critique of the megalomaniac and overspending neoliberal and nationalist cultural policy, on the expense of the social and economic stability of the already impoverished and largely unemployed population. Therefore, despite the initial politically driven motivations the protests resulted with most unexpected results that induced challenges for the understanding and interpretation of the phenomenon in visual, creative and aesthetical terms and motived this texts. For example, a certain need to look at the ‘redistribution of the sensible’ in terms of Jacques Rancière’s conceptualisation of the aesthetics as political and politics in aesthetic terms, took place in parallel with the ignition of the open democratic discussions regarding the redistribution and reclaiming of public space and the rights to the city in political and economic terms. Namely the main targets of the protests became the recent government’s controversial monumental and urban project known as ‘Skopje 2014’ that was initiated in 2010. Particularly attractive for the splattered colours were the Porta Macedonia, a triumphal arch (2010-2012) and the ‘Warrior on the Horse’ (which closely resembles Greece’s Alexander the Great and cost about 10 million euros). The both monuments started to be erected as a part of ‘Skopje 2014’ project. While the triumphal arch turned into a canvas of protestors’ participatory ‘artworks’ (that continuously changed as the government was cleaning the colour patches and spots), the fountain in the basis of the Warrior on the Horse turned red several times, as a symbol that stresses the leftist provenance of the Colorful Revolution. ‘Skopje 2014’ consists of numerous statues and monuments dedicated to various events and figures from the nationalist past of the country (that gained its independence after the dissolution of Yugoslavia), grotesque architectural interventions (e.g. neo-classicist make-overs of the existing buildings that were unique examples of late-modernist, brutalist and metabolic architecture that could also be interpreted as ‘critical regionalism’) and new office buildings for the growing public administration employees. However the author of ‘Skopje 2014’’s Master Plan was never revealed, nor has its scope been publically announced and discussed, before the start of its erection. Therefore, different leftist parties as well as civic society organisations and artistic groups argued that the Macedonian Government did not take into account the public opinion and the right to public space because it was built without any deliberation and democratic procedures and also when in 2015 several of these monuments were given an official status of “cultural heritage” this decision was not based on clear legislative and/or poll of the public opinion. Additionally ‘Skopje 2014’ has been criticised for lack of representations of the many ethnicities and for the dominance of militant and masculine figures with only few female statues (which even in such patriarchal context surprise with the explicit sexist visual regime of representation of the female body) so it was a question of time when this discontent will turn into a public revolt. The lack of existing terminology to analyse the consequences of the unique phenomenon (I oppose to the dominant use of ‘abstract expressionism’ because of the obvious difference in terms of art and political background of these performative actions) inspired me to propose to call this phenomenon ‘monumentomachia’ (battle of people against the monuments). In addition the public discussions questioning whether the results of the ‘Colourful Revolution’ could be interpreted as protest art which induced the need to introduce a new concept: ‘participatory institutional critique’ of the cultural policy regarding the national and contentious cultural heritage. I want to argue that despite the limitations of the usual background of the IC as individual artistic practice that can easily be recuperated in a vicious circle by the art institutions that are targeted by the very same critique (as it is usually argued in the context of contemporary art history), in this context it can be still relevant to investigate the emancipatory potentialities of the ‘merge’ between political and artistic ‘participatory institutional critique’. Based on agonistic pluralism, the democratic understanding of the right to the city public space and the solidarity ignited by shared negativity the paper also aims to propose a kind of critical discussion regarding the reciprocal, but also problematised relations between social movements and the general (mis)understanding of the discourses of visual culture, art and aesthetics by contesting the radical democracy ideas about agonistic space of Chantal Mouffe and Ernesto Laclau. The Colorful Revolution should be analysed also in the light of the recent return of the erecting monumental sculptures in public space in the post-socialist European contexts. Many historic monuments representing the communist leaders, and also other stylised sculptures that represented various events from the anti-fascist past have been destroyed after 1989, but recently have been replaced with figurative representations of some disputable heroic figures with nationalistic credentials. The Macedonian government project ‘Skopje 2014’ turned Skopje into a memorial park of imaginary past and false memories by inserting a series of ineptly cast figurative monuments the project provoked severe reactions from different social strata and initiatives (architects, workers, students or artists). This ‘castling’ appeals both to the populist taste and to the neoliberal governments whose eagerness for appropriating the public space and for overwriting its memory needs the support of the general public. However, the violated visual culture and the process of generating false memories induced the emergence of various self-organised movements that went on reclaiming the right to public space. The ‘triumph’ of visual violence and excessive power resulting with surplus of monuments is confronted by the mobilisation of the newly formed activist initiatives and small communities that self-organise around the loss of the access to the public space. This brings forward a different social awareness about the relevance of the commons wherein the old state-controlled socialist agendas failed and were dismantled. However the new social initiatives turned very fragile and fail easily in the fight against the carefully crafted conservative neoliberal interest groups that misrepresent their advancing in the public territory as common social interests. However the ‘monumentomachia’ – the battle between the protesters and the monuments that conquered the city square as the main space for protests takes place in different forms and levels and Colorful Revolution is one of the most unexpected and exciting public spectacles that has both, a critical and creative potentials. In the context of the Horizon 2020 research project TRACES– Transmitting Contentious Cultural Heritages with the Arts: From Intervention to Co-Production I therefore want to propose an analysis of the so called ‘Colourful Revolution’ in which the protesters threw paints on the figurative historic monuments and memorials (parts of the ‘Skopje 2014’) as a major shift from the usual individual artistic interventions (within the existing ‘institutional critique’ genre) towards a participatory institutional critique of the cultural policy regarding cultural heritage. Colorful Revolution is also intertwined with the issue of reclaiming the right to the city and the citizens’ participation in cultural policy regarding the public space and what is interpreted and protected as a cultural heritage (although the protests were directly motivated by the political instability and the Presidents’ decisions). I propose the concept ‘participatory institutional critique’ as a proposal of how to overcome the limited effects of the existing practices of institutional critique and interventions in museums. 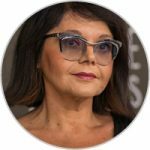 *In this critical paper, the TRACES researcher Suzana Milevska proposes an analysis of the so called “Colourful Revolution”, currently taking place in Macedonia as a major shift from the usual individual artistic interventions (within the existing “institutional critique” genre) towards a participatory institutional critique of the cultural policy regarding cultural heritage, and she brings forward the concept “participatory institutional critique” as a proposal of how to overcome the limited effects of the existing practices of institutional critique and interventions in museums. IMG. 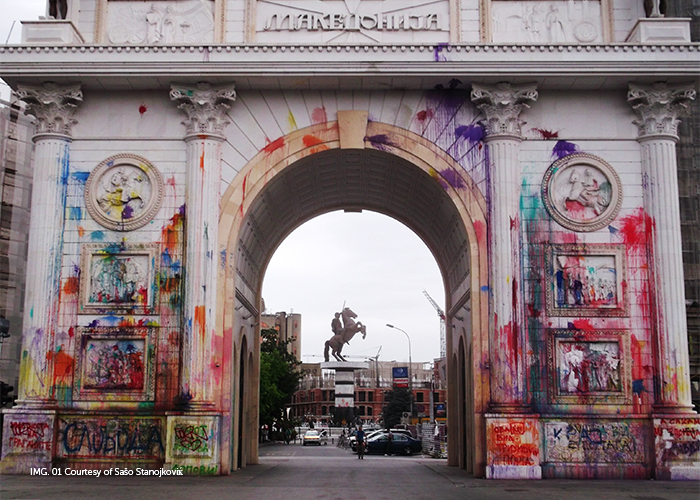 01 | Colorful Revolution: paintballing and graffiti, Triumphal Arch “Macedonia,” Skopje 2014 project, Skopje, 1 May 2016. Courtesy Sašo Stanojkoviќ. IMG. 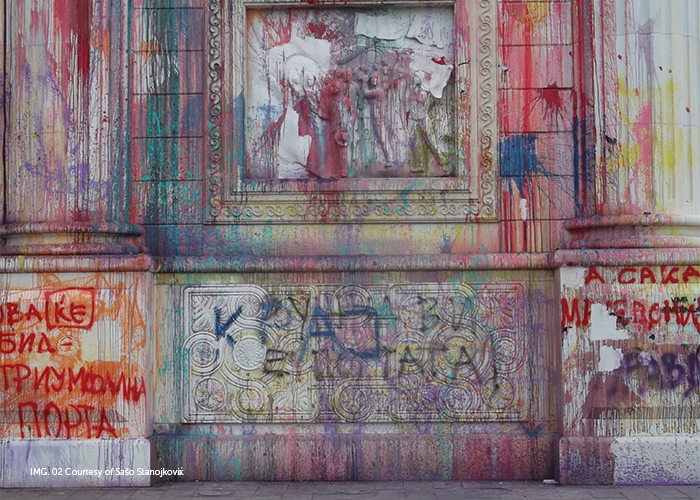 02 | Colorful Revolution: paintballing and graffiti, Triumphal Arch “Macedonia,” Skopje 2014 project, Skopje, 1 May 2016. Courtesy Sašo Stanojkoviќ. IMG. 03 | Sašo Stanojkoviќ,Let them Eat Monuments, 2014. Participatory project with a chocolate multiple of warrior on a horse. Presented in the framework of the workshop Participatory Monuments, with Chto Delat, Face to Face with Monument, Schwarzenbergplatz, Wiener Festwochen, Vienna. Courtesy Sašo Stanojkoviќ. IMG. 04 | Sašo Stanojkoviќ,Let them Eat Monuments, 2014. 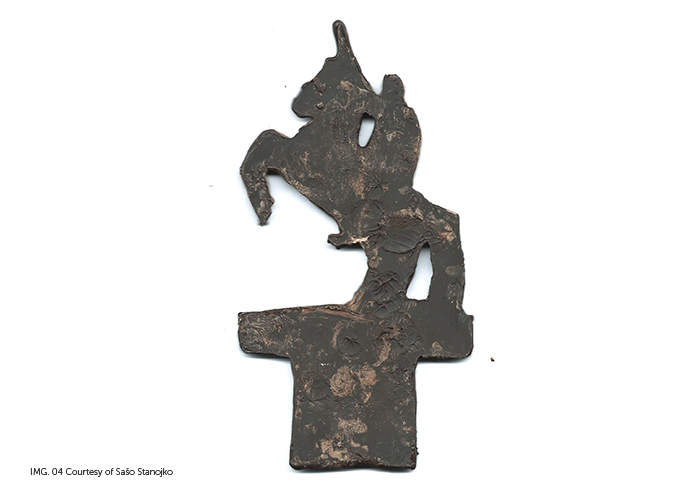 Participatory project with a chocolate multiple of warrior on a horse. 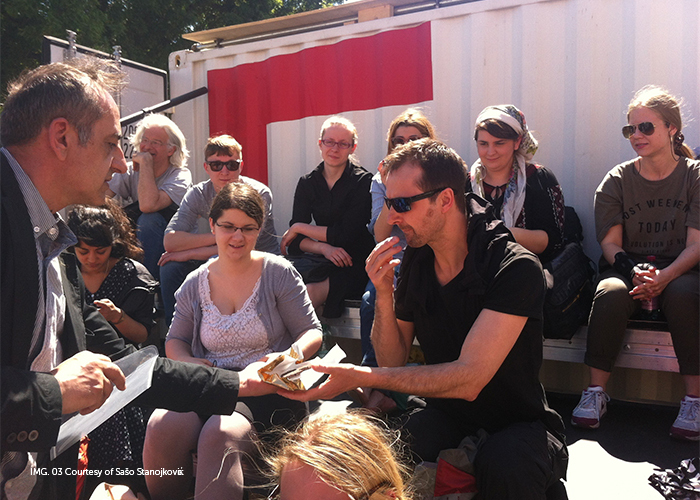 Presented in the framework of the workshop Participatory Monuments, with Chto Delat, Face to Face with Monument, Schwarzenbergplatz, Wiener Festwochen, Vienna. Courtesy Sašo Stanojkoviќ.